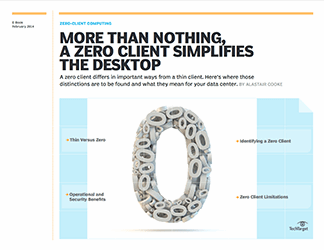 The zero-client computing e-book series delves into essential aspects of how virtual desktop services can be provided with as little configuration as possible. Many vendors sell zero clients that do not in fact require zero configuration, so definitions tend to be fluid. 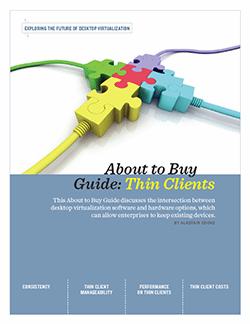 These chapters will counter that vagueness with specifics on the distinctions between zero clients and thin clients, as well as guidance on how best to implement and manage zero clients. 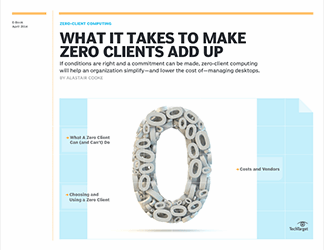 This chapter looks at the major considerations in making a final decision on whether to move an organization's desktops to zero clients. Cost, return on investment and vendor choice are among the most essential factors to be weighed. The chapter also discusses the complexity of a shift to a zero-client model. Chapter 3 explores the post-rollout steps for an organization that has adopted zero clients. Once they are in place, IT needs to know how to manage and monitor desktops effectively from the data center. Though minimal maintenance is necessary, admin concerns and software updates must be addressed in a timely manner. 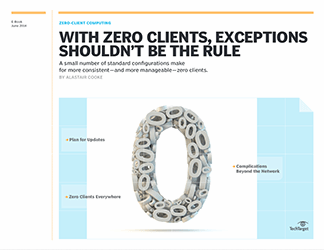 By understanding the best practices for managing zero clients, IT can truly maximize ROI and make sure employees have the tools to do their jobs without disruption.